Safe access onto the sloped roof and off again must be considered from an alloy tower or suitable access solution provided to work at height regulations guidelines. 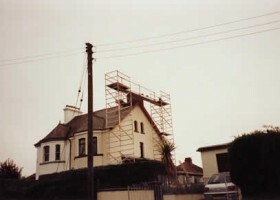 Ridgeway Chimney Scaffolding is a high specification product offering the ultimate in safety for working around chimney stacks and other high level obstructions. This lightweight alloy product is available for hire and sales complete with an on-site erection facility from Ridgeway On-Site Services. With Health and Safety requirements becoming increasingly more demanding on employers and contractors, Ridgeway Chimney Scaffolding is the perfect answer to ensuring the safety of operatives when they are working on a pitched roof. The custom designed unit has many advantages and safety features. Instant adjustment to provide a level platform on most roof slopes. No pre-adjustments or settings necessary. No special tools or spanners required. Soft padding on Ridge Hooks, Hangers and Folding Adjustable Frames to protect roof tiles. Complies with requirements of Construction (Design and Management) Regulations, 2007. Each unit adjusts instantly to provide a level platform on most roof slopes. No special instruments, tools or spanners required. Universal Guardrail unit c/w captive toeboards & toeboard clamp. Extension tubes are available for access to stacks and dormer windows between the ridge and eaves. Available as a full unit as pictured or alternatively as half or quarter units to meet specific customer requirements. Access system for working around chimneys and other high level obstructions. Suitable for most roofs and slopes. High loading capacity – up to 764kg, on a full chimneyscaff unit, subject to the safe working load of the roof. Semi automatic frame collar locks on Folding Guardrail unit. 6 x infill scaffold board platforms – toeboards (with ends arrised and plated) provided for completion of all round decking and toeboard areas. Note: Some chimney stacks may require less infill boards whilst other stacks may require more. 8 off clip-on adjustable guardrail braces with locking couplers provided. Soft padding fitted to Ridge Hook, Hanger and Folding Adjustable Frame to protect roof tiles. Swivelling spigots to accept Folding Guardrail Unit. If necessary the spigots are easily frictionally adjusted. Patented extruded hooks on Platform Boards. Platform hooks both welded and bolted.